Today with the internet and web sites like Freelancer.com, you would think it is possible to find native speakers of any language who can readily do translation for you and prepare documents like instruction manuals. And with computer packages like InDesign, you would think that the job of setting up a professionally printed instruction booklet again would be trivially easy. Well, maybe in some languages, but not in Urdu. This has been a fascinating learning experience, and frustrating too at times. I never imagined that translating our air conditioner user manual and getting it designed ready for printing would have been so difficult. This manual is critical for us: few people will read it, but the few who do will pass on that knowhow to lots of other people. It’s really important that they get it right. With the manual finally completed, albeit in several separate sections, I started by arranging for a Karachi-based “freelancer” to do the translation, using freelancer.com. Lots of freelancers wanted to do it, but few were Pakistan based and I knew that having a translator based in Pakistan was going to be really important. Imran produced a translated document in MS Word text in a few days. The job was done for about $350 by the end of February. (I have used pseudonyms for most of the characters in this story). There were four sections in separate documents which were translated and combined into a single document: a guide for setting up the tent, a guide for folding it and packing it, a guide to the air conditioner itself, and a guide for selecting a suitable UPS (uninterruptible power supply) and battery set. As a further check, we gave a printed version of the tent instructions to our cook, Sajjad, and asked him to follow the instructions and set up the tent. It worked. Hassan watched. Sajjad did a good job, but stood the AC unit on a cushion to raise it to the right height. It was leaning over when I saw it later. Hassan told me that Sajjad had looked at the pictures more than the text, so I knew the illustrations would be critically important. I realised we needed clearer instructions for some parts of the procedure. So far, so good. Some small changes and improved diagrams fixed the cushion issue. I arranged for another freelancer to convert the original photos to drawings which would reproduce more clearly. Then I asked our business manager, Mehmood, to get the whole document designed ready for final printing. We decided that, since many people are not fully literate in Urdu, and not fully in English either, to design the layout with English on the left side of each page and Urdu on the right, so readers could cross-refer to reduce ambiguity. Illustrations were to be on the middle of each page as they are common to both languages. In a few days we had a sample laser print-out ready for review. Now the troubles started. I asked Mehmood to carefully proof-read both English and Urdu to check for mistakes. He noticed some repetition which I had missed. Then I realised that some of the introductory material from the air conditioner instructions needed to be right at the front of the book, so I laid out all the pages on the floor and shuffled some to make the sequence logical. 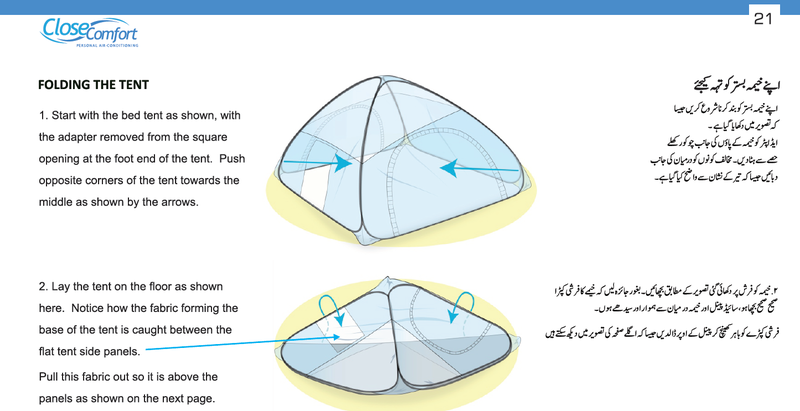 Pages for tent washing instructions were added, and later a page to show how to use the AC with a mosquito net. In the course of making these changes, I noticed many mistakes in the document such as missing or duplicated sections of text (in both the English and Urdu material, but in different places). There were numerous formatting and paragraph alignment mistakes, and incorrect fonts and font sizes had been used in some places. Mehmood had arranged with a contract designer to prepare the document ready for printing. Although I wrote out all the changes carefully on the paper print-out, when he sent a revised PDF for checking, I noticed that many new mistakes had appeared, and while many of the changes had been done, several had been missed. By now it was mid-March. I suggested working with the designer directly. He obliged and the designer, Nadeem, spent a Saturday afternoon with us. Although he did not speak English, he worked alongside Mehmood who explained the changes I was asking for. After some time, I was satisfied that all the remaining work could be left to the two of them. Samina and I had to leave for Lahore, and they were to send me the finished document for checking as a PDF, and also arrange for a proof copy to be printed and sent to me in Lahore by courier. Another problem had become apparent during the afternoon. Even though I had initially provided high resolution copies of the illustrations for the manual, somehow, someone (no one knew who, of course) had substituted low resolution images. I thought that, as is the case with MS Word, for example, that in generating the PDF proof copy for checking, the image resolution had been reduced to keep the size of the PDF document reasonable for emailing. No. Somehow the high resolution images had been lost. I provided another full set of illustrations and uploaded them to our shared “cloud” and all Mehmood had to do was to get the designer to replace each of the images with new ones. When the PDF document arrived, the image quality had improved, but I noticed that there were still mistakes that had not been fixed. Also, some new mistakes had been introduced, but I thought these could be corrected once the proof copy had been checked. The proof copy was a disappointment. There were still more mistakes that had appeared, and some of the illustrations were so faint they could not be understood. Quite by chance, visiting our tent manufacturer, I showed the proof copy of the instruction manual to the factory manager and he pointed out that the Urdu text was not, in fact, in Urdu, but reproduced in an Arabic font! He said it would be more difficult for Urdu-speakers to read and should be changed to an Urdu font. I relayed this request, along with the other corrections to Mehmood in Islamabad. The designer, apparently was unavailable till the following Saturday. When he did appear, the power at the office had failed due to an electrical fault so work was impossible. Meanwhile Samina and I had returned to Islamabad. Mehmood decided to work with him at his own office, so I did not see them before we had to depart unexpectedly for Lahore again, this time for a double funeral: two relatives by marriage, both brothers, had died in a motorway accident late on Friday evening and the funeral would be on the following Sunday. Inside the “Jewel of Lahore” – the Wazir Khan mosque in the Old Walled City now being beautifully restored. Another proof copy followed us by courier and arrived on Sunday evening April 3. When I checked it along with the PDF, my heart sank. Yet more errors. Yes, the text was now in Urdu font, but the size of the characters changed from place to place, and some small sections of the English text had disappeared. Contents page headings were no longer aligned with the page numbers, and some of the page numbers were now in italics. Still the diagrams were disappointing in quality. Finally, and most obviously, the order of the illustrations on a particularly important page had been changed, making the instructions meaningless. This was particularly disappointing as I had taken trouble to make sure that every illustration file was named with the page number and the position on the page. I called Mehmood and asked why he had not noticed all the mistakes, particularly the spelling mistakes on the front cover. I asked why some changes I had requested three or four times before had still not been done. I asked him why the diagrams had been incorrectly inserted. He explained that there was not one designer involved, but three. Each had software that enabled him to do just part of the work, so it had to be passed back and forth for each change, and in doing so, the changes had been overlooked, inadvertently undone, or errors introduced due to misunderstandings. Khalid suggested we sit with his expert designer who does his Urdu books, and it was only then that I began to appreciate what’s involved in Urdu publishing. We met Khalid at a small computer shop on one of the busiest intersections in Lahore, near the prestigious “Defence” areas where military groups had sold land formerly part of a defence zone between Lahore and the Indian border. It was noisy, and during load shedding every hour or two, a fiendishly noisy rattling generator was running just outside the open doorway so they could run their photocopier machines. We sat on either side of Pervaiz, a very skilled graphics software operator, and watched as he set about fixing the mistakes. Pervaiz managed to convert the latest PDF of our user manual from Mehmood back into a Corel Draw file, though the text elements could not be directly edited. They could be deleted and replaced, though. By now I realised that all the Urdu text had been prepared using InPage, and inserted into the final document as curved vector graphics, not characters. The closest analogy is a computer-drawn character rather than one represented by a standard shape as is the case with convention alphabetic typefaces. Although prepared by typing the letters of Urdu words on a keyboard, InPage performs the necessary (and complex) rules of written Urdu to join some characters together and not others. Each character has up to three or four different forms, depending on whether it is at the start, middle or end of a linked series of characters. A series of characters starts high above the line and generally descends unevenly, so each different character may not even be at the same height. Diacritical marks (dots, bars and other more elaborate sub-characters) appear at different places relative to the main characters depending on context. InPage does all that automatically and generates a series of drawn shapes. These are then copied and pasted by the operator into the Corel Draw document representing the printed pages. Enlarged view of Urdu text at top left of page reproduced above. Unlike a package like InDesign, the layout is entirely manual. There is no automatic flow of text from one page to the next, and diagrams have to be inserted manually and the lines of text trimmed or adjusted in size to fit. Each interlinked sequence of characters can be individually moved and squeezed closer to its neighbours if needed, but all this has to be done by the operator using the mouse and menu commands. A tediously slow process, and error-prone. More like drafting, engineering computer-aided design and drawing, quite different from word processing as we in Australia would know it. Samina and Khalid sat on one side of Pervaiz, scanning the text on the screen for mistakes. They had checked the printed pages beforehand, but there were so many mistakes that trying to label the pages with editing marks was pointless: Pervaiz could not have followed their marks. Pervaiz himself, though educated and an expert computer operator, was quite unsure of the spellings, even for simple words. Complicating the text are frequent transcribed English words, words for which there is no Urdu equivalent, literally spelling out the English word in Urdu script. Except, people make up the spelling according to their own approximate pronouncing of the word so “Air conditioner” appeared throughout most of the document as “air kund-schnner”, “air condishn” and other variations. Out of a hundred or so references, four were spelled correctly in Urdu matching the English spelling. “Plug” appeared in one place as “pul” (a flower). In many instances as well, completely inappropriate Urdu words and expressions had been used, such as guhtna (knee) instead of ghanta (hour): literal spellings of mispronounced Urdu. Some English words also appear in the text spelled out in their Roman letters in brackets, to clarify the intended meaning. However, the local use of the word appears, which is not necessarily the English meaning. Hence the term “specific gravity” used to refer to the concentration of acid in a battery appears in the Urdu spelled as “gravitee” and then as “(gravity)” without the “specific” qualifier: in Pakistan batteries are such a significant part of life that just “gravitee (gravity)” is sufficient. One of the most amusing mis-translations occured at the last page in the instructions on appropriate disposal of the air conditioner for recycling. “Disposal of personal air conditioner” was translated as “Destroy personal air conditioner”. Since the Urdu text is “drawn” instead of being represented by characters, it is not possible to search for the same instance of a word elsewhere in the document. Manual scanning by eye is the only way to find mistakes. The original translator did not have a good enough understanding of English to understand what was really meant by many of the words in the document, and did a “Google” word for word translation for much of the document. Whenever he could not find or did not know of an Urdu equivalent himself, he simply wrote, for example, “setting up tent” in Urdu script, using an Arabic character font. Careful reading was needed to detect all these (rather frequent) lapses and substitute appropriate Urdu words. This, by the way, simply models the way people speak, switching between Urdu, English and their mother tongue (Baloch, Punjabi, Pashto, Serayiki and several other regional languages), seemingly at random. Six hours later, Khalid remarked that the whole job would have been much easier if the text had been hand-written first and then transcribed to InPage as a contiguous body of text. Then it would have been possible to do some searching. However, the text would still have to be transferred manually into the final Corel Draw document for the final printing, but only when the entire text had been proof checked. Of course, that overlooks the point that no one who had up till then been involved with the document, myself as the English author, the translator, three designers in Islamabad, Mehmood who contracted the designers and claimed that he had proof checked the document, Jawad who said it was “understandable enough”, even Pervaiz the expert Corel Draw operator and computer shop owner in Lahore, none of us could have produced a correctly spelled Urdu handwritten document for transcription. It’s important to add that we had already encountered this problem in different ways before. We needed a really brief description of the air conditioner to explain it to participants in our market research study. The Lahore-based market research firm, a good one, translated our English version into Urdu, but Samina had had to make many changes. In several places, the Urdu misrepresented the English from which it had been translated. Well educated people, these days, regard an inability to speak, let alone read and write Urdu, as a mark of social distinction. Even though everyone can make themselves understood in the typical spoken mixture of Urdu, Punjabi and accented English, there is still plenty of room for misunderstanding. Creating a set of instructions in Urdu, using appropriate Urdu words, spelled correctly to minimise misunderstandings, with minimum ambiguity as well has turned out to be a task that almost no one can do here. We have been fortunate indeed, through Samina’s family connections, to have help from one of the best experts remaining in Pakistan. Think about this country of nearly 200 million with eight or nine regional mother tongue languages, mixed with Urdu, the national language and each other and English, and few people with reliable knowledge of grammar and spelling, laws written in English, but almost everything from court proceedings to government policy discussions in a mixture of local languages, Urdu and English. Room for confusion? It’s not surprising that so much is lost in translation, and misunderstandings thrive. This entry was posted in Uncategorized and tagged air conditioner, Corel Draw, electronic typesetting, InPage, instruction manual, literature, Pakistan, publishing, translation, typesetting, Urdu. Bookmark the permalink.